Intended as the replacement to the firm’s enthusiast compact GX1 model the new GX7 has similar rangefinder-like lines but improves on the original in a number of significant ways. The most obvious perhaps is the inclusion of a built-in articulated widescreen electronic viewfinder and touchscreen LCD. This camera is also the first Lumix G-series model from the firm to feature built-in image stabilization, albeit not the same 5-axis stabilized sensor platform as found on rival high-end Olympus models. 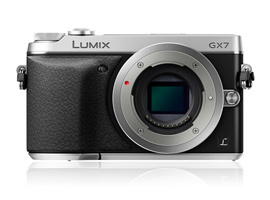 Panasonic says the GX7 adopts a new 16-Mpix L-MOS sensor with a redesigned on-chip lens arrangement and promises increased saturation, an improved SNR and an increase in detail. But that’s not clear if the firm is comparing the upgraded sensor and associated electronics to the GX1 or the more recent top-of the range GH3. The increase in detail, claimed to be 10% in the press release published at the time of the camera’s announcement is particularly of interest. Unlike rival firms, no mention has been made of the sensor’s optical low pass (anti-aliasing) filter but it’s likely the filter has been modified to enhance AF performance and improve detail. 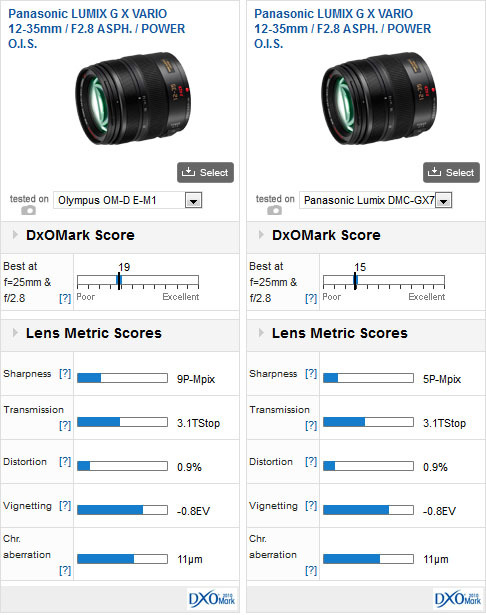 Taking that into consideration our labs have evaluated the optical quality of over 30 different lenses on the camera from both Panasonic and Olympus, and we’ve also included the results from Sigma’s new DN range of prime lenses made specifically for mirrorless cameras. We’ve analyzed close to 20 zooms and 15 primes in total, recently adding the new high-grade Olympus M.Zuiko Digital ED 12-40mm f2.8 Pro and the recently upgraded Panasonic 20mm f1.7 ‘pancake’ lens, previously one of the most popular lenses in the range. Panasonic has also updated the 14-140mm, a hugely versatile lens that was compact in size, stabilized and parfocal in design, making it very attractive to filmmakers. We’ve included the two models in our results. If you have any particular lens you would like to see tested, please leave the details in the comment section below this article. The top-performing model on the GX7 is also the most expensive prime in our database, and made not Panasonic but by rival Olympus instead. The 75mm short tele has a stellar reputation and is the equivalent of a 150mm. With an f1.8 maximum aperture it’s a promising option for low light venues, indoors sports and action, as well as outdoor portraits. Although large for a MFT format lens it’s still compact with an overall length of 69mm. Wide-open on the GX7 it’s not too sharp for portraits but sharpness improves when stopped down. In second place is another highly respected if also somewhat expensive model, the fast standard Leica 25mm Summilux. It has very fast focusing and it’s sharp centrally from f2.0 onwards. In third place is another highly regarded optic, the Olympus 45mm f1.8. Like the 75mm on the GX7 it has a good sharpness when stopped down from the maximum aperture. With a useful 0.5m closest focusing distance, it’s a highly attractive option for portraits. At a reasonably modest $239, Sigma’s 60mm f2.8 is another tempting alternative. As a high speed standard, Panasonic’s upgraded 20mm f1.7 ‘pancake’ lens is another excellent performer and a popular choice. It has similar peak sharpness to the Leica 25mm ‘lux’ while being both smaller and more modestly priced. As the equivalent to a 24mm, the Olympus 12mm f2.0 is the best performing wide-angle lens in the group with a DxOMark score of 17 points and a 6P-Mpix peak sharpness. Like the primes you do tend to get what you pay, and it’s unsurprising perhaps to see the less accessibly priced models sitting at the top of the league as revealed in the OM-D E-M1 lens recommendation. In first place is the new Olympus 12-40mm f2.8 Pro at $1,000. It’s an excellent performer and it has a mechanical manual focus option with hard stops, making it an excellent choice for filmmakers. Panasonic’s 12-35mm f2.8 has similar overall IQ and is pricier still but it has optical stabilization built-in. Keep in mind that’s not really necessary on the GX7 as it’s the first model from Panasonic to feature in-body stabilization. In second place is the 35-100mm f2.8. As the equivalent to a 70-200mm it’s a good performer optically and even has higher peak sharpness than the 12-35/40mm models. Although a welcome addition to the system the performance gains are made at the shorter end of the zoom range. And at $1,300, it’s not for everybody. Key lenses to look for include the 7-14mm and the 9-18mm as wide-angle choices. Both models perform similarly overall with DxOMark scores of the 12 and 11 points, respectively, and with peak sharpness measured at 5P-Mpix. Another important lens in the line up is the 14-140mm. As an equivalent to a 28-280mm this small and compact parfocal zoom is often the first choice for moviemakers and is one of the most versatile models of any current CSC compact system. The original has recently been upgraded and has a slightly faster maximum aperture, new improved focusing and stabilization (perhaps unnecessary on the GX7) and, best of all, it has improved optical performance. 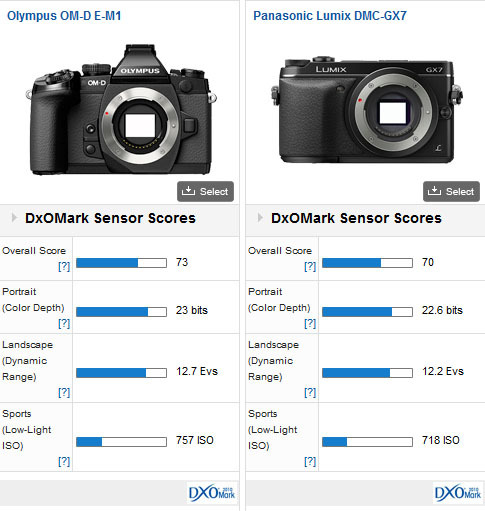 We were curious to compare the sensors of both the GX7 and the Olympus OM-D E-M1. Both models have a L-MOS type sensor with the same pixel count (16-Mpix), but the E-M1 is known not to adopt an optical low pass (AA) filter that should, potentially, deliver higher sharpness. 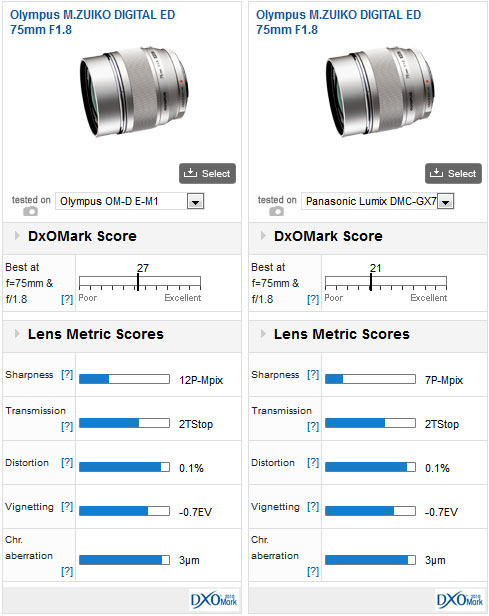 Our DxOMark sensor performance tests don’t include perceived sharpness results as the optical system is incomplete, instead we must rely on our DxOMark lens tests for that. We were intrigued to see just how well the cameras performed with the Olympus 75mm f1.8 lens. As the highest performing model in our database, it’s the most likely to reveal any differences in the perceived sharpness of the two systems. 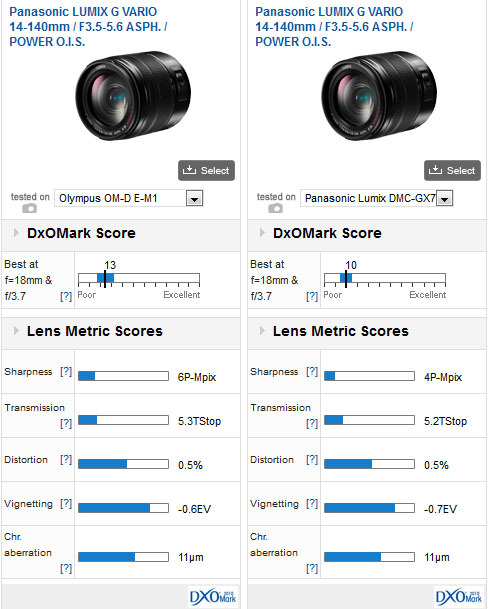 The difference measured in P-Mpix in our Lens metric scores reveals the OM-D E-M1 sensor is potentially capable of higher sharpness than the unit found in GX7. With the 75mm f1.8 mounted, it achieved a higher peak sharpness value of 12P-Mpix, implying an increase of up to 5P-Mpix may be possible by implementing an equivalent sensor without an AA filter. With those results we were then compelled to test the high-grade Lumix GX Vario 12-35mm f2.8 ASPH. As expected the E-M1 combination did well, achieving an increase of 4P-Mpix over the GX7 with the same lens. Such big gains aren’t possible with lenses with much lower resolving power. The 14-140mm may be very versatile lens but the peak sharpness was just 6P-Mpix on the OM-D E-M1 dropping to 4P-Mpix on the GX7. Keep in mind however, that while the GX7 appears to have a strong AA filter, the removal in various models may result in color artifacts or moiré and that may also apply to video as much as stills, where it’s very challenging to eliminate completely. If you have a Panasonic GX7 and a favorite lens, we would very much like to hear from you. Please leave a comment below, stating what lens it is and why you like it.